I've been reading and enjoying quite a few Christian fiction books this year (as you can see on my Books Read page). I recently completed The Bridge Tender (A Sunset Beach Novel), which I received free from Booklook Bloggers in exchange for an honest review. This book is a quick, easy read about a young widow, Emily, whose husband left an insurance policy with stipulations that the funds be used to purchase a house at Sunset Beach (where the couple spent their honeymoon). In her grief Emily doesn't really have much interest in following through on their dream to buy a house there, however a year after his death she does return and purchase a house. The story follows her through her first summer in this home as she meets some of the locals and makes friends, including a harried mom of two who lives next door, a pregnant teenage girl with no family to speak of, and a new love . . . who happens to be the actor from her favorite movie that she had a crush on as a teenager! 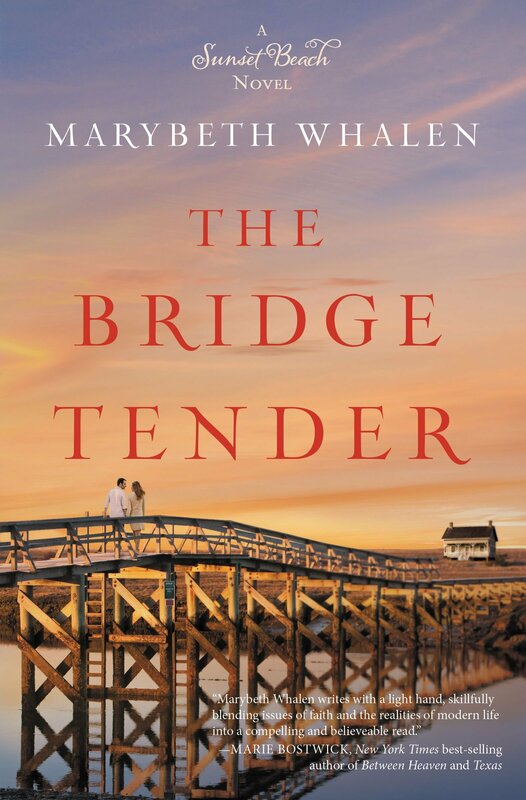 The town is divided over replacing the old swing bridge with a new one, which acts as a metaphor as Emily tries to figure out how to move from her past to a new future. A good book for a summer read. Over the next week or so, I'm planning a few catch up posts with quick reviews of the other books I've read so far this year (Christian fiction, popular fiction, non-fiction, young adult, etc). What genre(s) of books are you reading lately? Scrapbooking Supplies Used For . . .
One thing I really like about having a huge stash of scrapbooking supplies is the fact that it can be used for all sorts of other crafts . 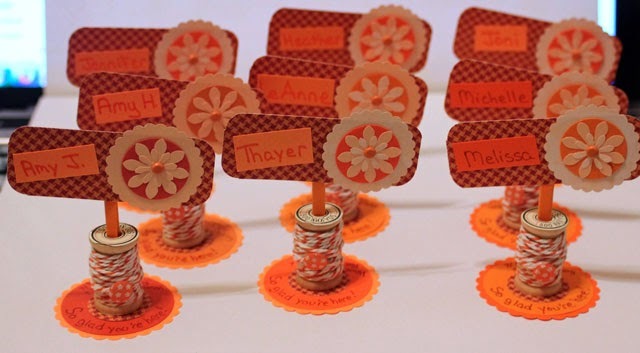 . . like these canvases . . .
. . . and these name plates . . .
. . . and these cards. 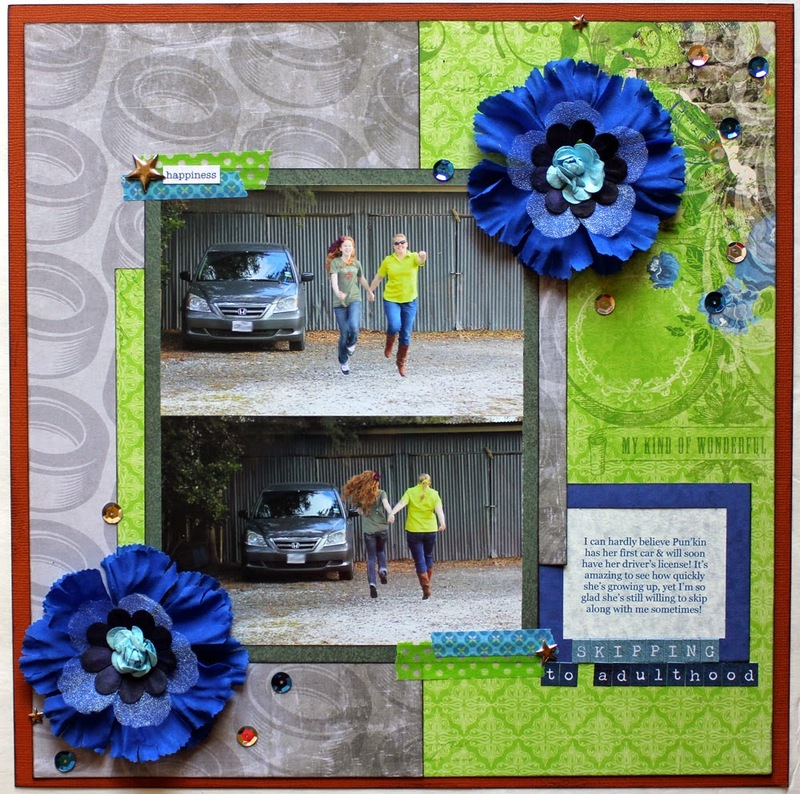 What have you been creating with your scrapbooking supplies lately? BTW - I have a new layout up on the Scrappin' Goodtime blog, showcasing a photo from our favorite vacation destination! Click here to see the complete layout. This year one of my goals is to read the Pulitzer Prize winners in fiction and review them here on my blog. I've just finished reading the 1968 winner, The Confessions of Nat Turner by William Styron. I have to admit that it took me a long time to complete this book as it was a difficult read for several reasons. First, the book is based on the true story of a slave uprising led by Nat Turner in 1831. Fifty-nine white people were killed during the revolt. The insurgent slaves were either killed during the uprising or were tried and executed. Before his trial and hanging, Nat Turner gave his confession to a white lawyer. In the published confession, Nat Turner claimed to have been divinely inspired, charged with a mission from God to lead a slave uprising and destroy the white race. This book is a fictionalized account of Nat's life and his motivations and actions leading up to the revolt. Second, the book is narrated by Nat Turner and his thoughts (as fictionalized by the author) range from simple observation to highly emotional (particularly passions of intense hatred) with forays into crude, vulgar, and sexually explicit scenes. The writing is extremely well-done and draws the reader into the story and almost seems to take an emotional toll - if that makes sense. I often needed to just stop and digest a section (and read something lighter!) before moving on. I think it may have been seen by now how greatly various were the moral attributes of white men who possessed slaves, how different each owner might be by way of severity or benevolence. And finally, I found this book difficult to read because of the vernacular of the Southerners and slaves, which tended to slow down my reading. Here's an example - a reply from one of Nat's followers as they were preparing to begin the revolt. "All my niggers is ready an' rarin' to go," he said. "Austin say he could maybe sneak away from de Bryants' dis evenin' an' jine us at Travis's round' 'bout nightfall. If'n he can, he gwine bring Bryant's horse." In all honesty this book is extremely well-written and thought-provoking, and I can definitely see why it won this coveted prize. I'm glad I've read it, however it's not one that I'll return to every few years to re-read. Have any of you read this book? Please share your thoughts in the comments. Cheri is hosting a new 6-month meme on her blog called Life Tunes. When I first read that this month's theme was "young love" or "summer love," it immediately brought to mind images of my Daddy strumming his guitar and singing the song Young Love. Daddy was always singing, around the house, in the car, at church, out fishing, just about everywhere. Despite the fact that I really can't carry a tune, I loved singing along with him and remember many times loudly singing along in the car to songs on the radio or (gasp) an old 8-track as we traveled somewhere. I honestly can't remember if my sisters or Mama ever sang along, and I look back now and wonder how they put up with us at times! I have a Project File in my craft room where I'm collecting photos, memorabilia, papers and embellishments with a music theme. I also have some old 45s that I'm planning to use as "pages" in a mini-album . . . someday. Maybe Cheri's new blog meme will be the push I need to get started on that project. For now, I'll leave you with a YouTube video I found of the song "Young Love." Do any of you remember this song? Did you ever sing along to it? I had to laugh when I read Rinda's post from last week that said lamp posts seemed to be the most popular find (besides gnomes) so far in this year's Summertime Photography Scavenger Hunt because I finally got a start on the hunt last weekend . . . and my first find was #17 - A Lamp Post! 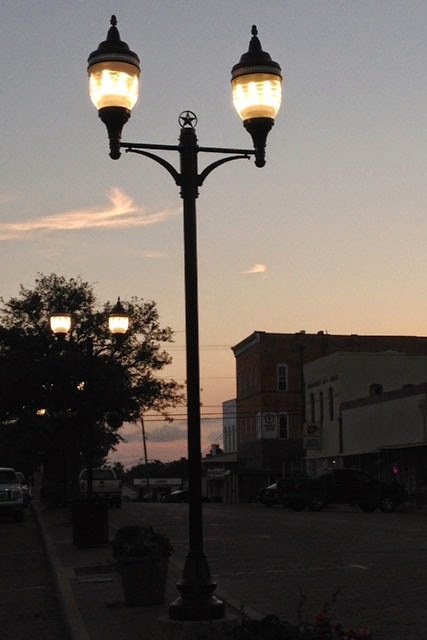 I noticed these lamp posts as Robbie, Daddy and I were walking back to our car after attending a FUN auction in a nearby small town. 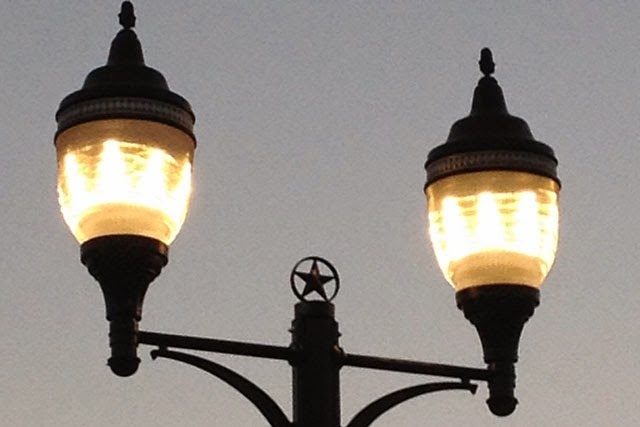 I'm glad I was also thinking about Helena's Zoom In/Zoom Out meme and zoomed in to capture something unique to these lamp posts - the Texas star! There are still a couple of days until the official start of summer, but summer is in full swing here with lots of sunshine and temperatures already reaching into the 90s! Is your summer off to a great start? Are you participating in this year's hunt? I have a three-ring binder with page protectors to hold photos that are 5x7 and 8x10, and recently I've been enjoying getting some of those larger photos on layouts. I actually created this first layout a couple of months ago in response to the challenge in the Stashbusters Anonymous workshop to use large metal embellishments. Yes, that's me as a one-year-old. This next layout showcases a photo of me and my sisters when I was about nine-years-old. 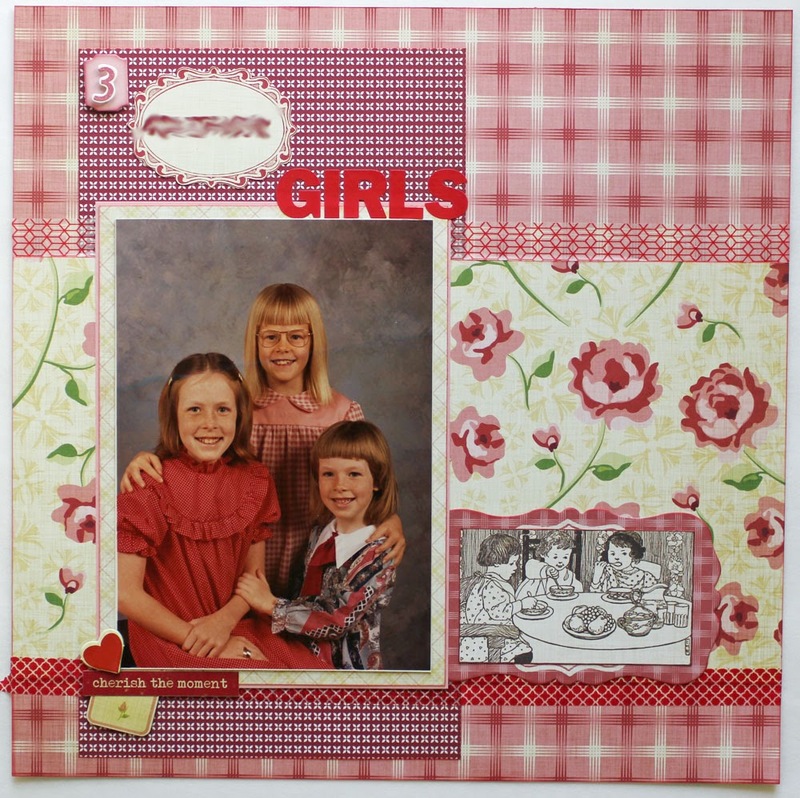 I just had to use that cute little tag with the three girls on it as an embellishment! 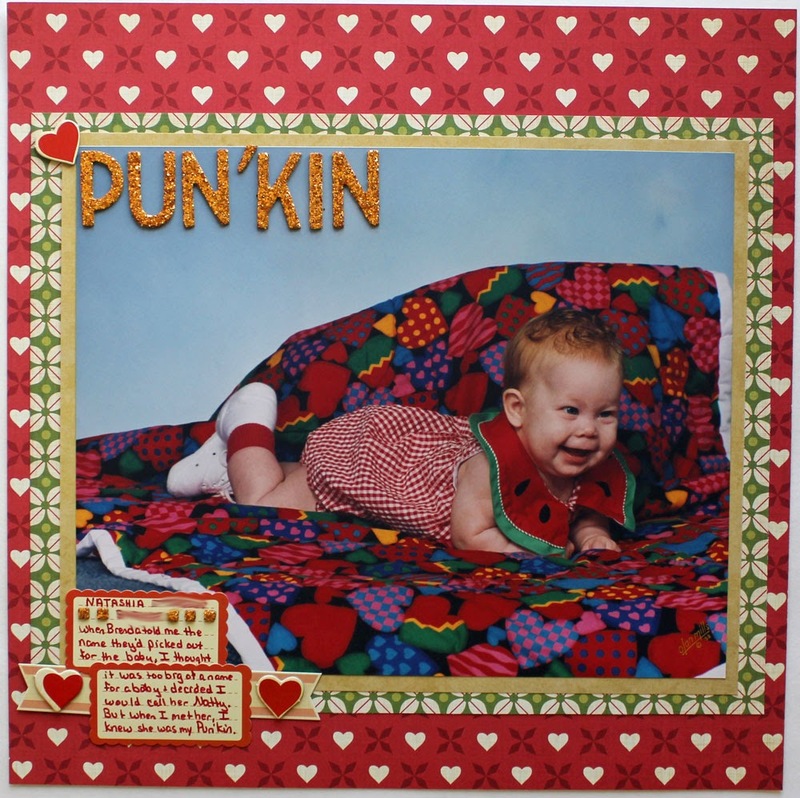 And here's one with a photo of the now sixteen-year-old Pun'kin Natashia! Journaling reads: When Brenda told me the name they had picked out for the baby, I thought it was too big of a name for a baby & decided I would call her Natty. But when I met her, I knew she was my Pun'kin. Have you scrapped any larger photos lately? Several weeks ago Debbie honored me with the Liebster Award - thank you Debbie! I've received this award before and passed it on, so today rather than following all the "rules" I'm simply sharing my answers to the 10 FUN questions Debbie asked in her post about the award. 1) What is your go to crafting item lately? This is a tough one as I've been creating a ton this year and am enjoying using a variety of items in my rather larger stash. 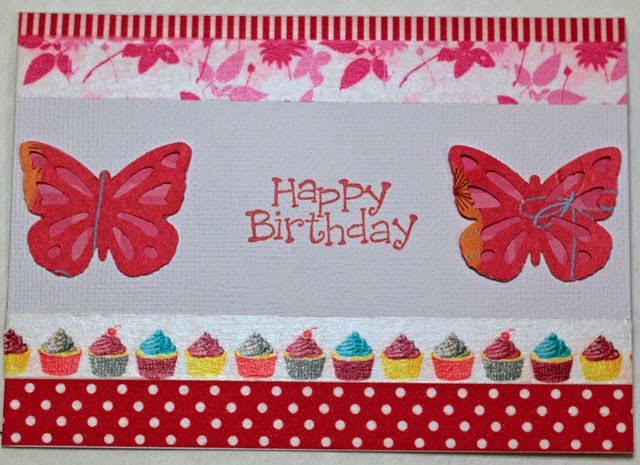 Of course, I couldn't create without patterned paper . 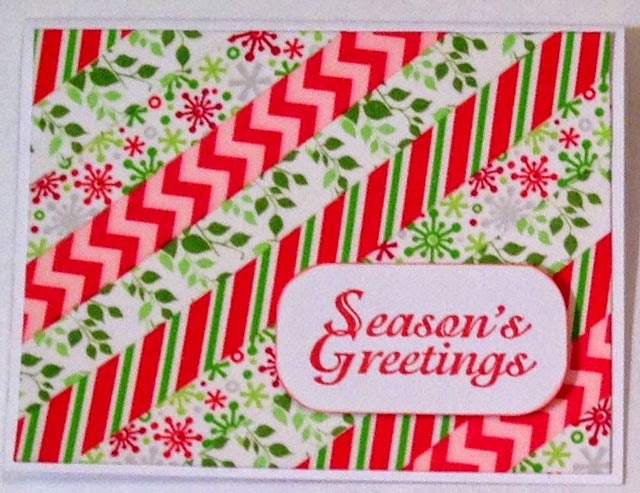 . . and washi tape! 2) What is your favorite book that you have read? My all-time favorite is the Bible, which I've read through several times. My favorite non-fiction is The Hiding Place by Corrie ten Boom. My favorite fiction is Gone With The Wind. 3) Would you rather take a car, train, or airplane to your travel destination? Yes! Any mode of transportation is fine with me as long as I'm with Robbie and we're headed off on an adventure. 5) What is your all time favorite dessert? Grandma's Pecan Pie . . . and anything chocolate, of course! 6) Do you have a nickname? Daddy calls me Syrpo . . . it all started with Karo Syrup, but that's a story for another day. 7) What is your worst phobia? This is a tough one . . . probably being alone, completely alone, not in the physical sense of there not being anyone around me, but not having anyone that I'm close to, that I can count on and lean on. 8) Do you have a lead foot when you drive, or do you take it nice and easy? I take it nice and easy now . . . but you may recall from my teenage driving stories that it wasn't always that way! 9) What's your favorite board game? Scrabble - it's FUN, it's challenging, it's purported to stave off Alzheimer's, and I usually win! 10) Paper or plastic? Usually a canvas tote, otherwise paper if available. Thanks again, Debbie, for the award. I hope y'all enjoyed learning a little more about me through Debbie's questions. I'd love for you to pick one or two and share your answers in the comments. 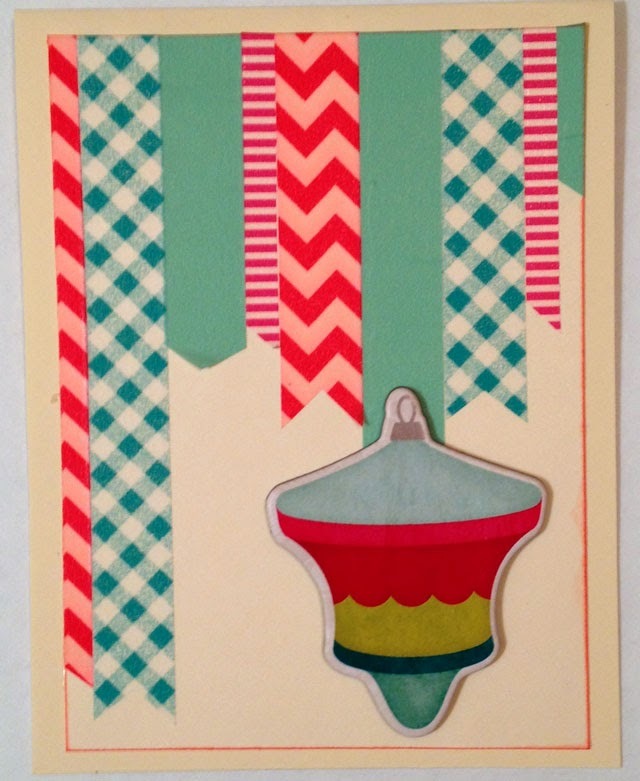 After creating the gift tag inspired by Jennifer's Refresh Your Craft & Soul event this past weekend, I didn't have much time to create. However I did read and enjoy all the blog posts over the weekend and knew I had to try the Washi +Words cards she shared. I had so much FUN putting these cards together! 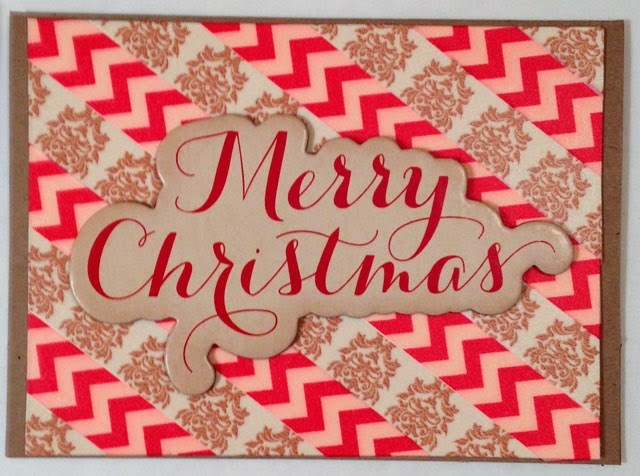 My favorite design uses washi tape adhered on a diagonal. 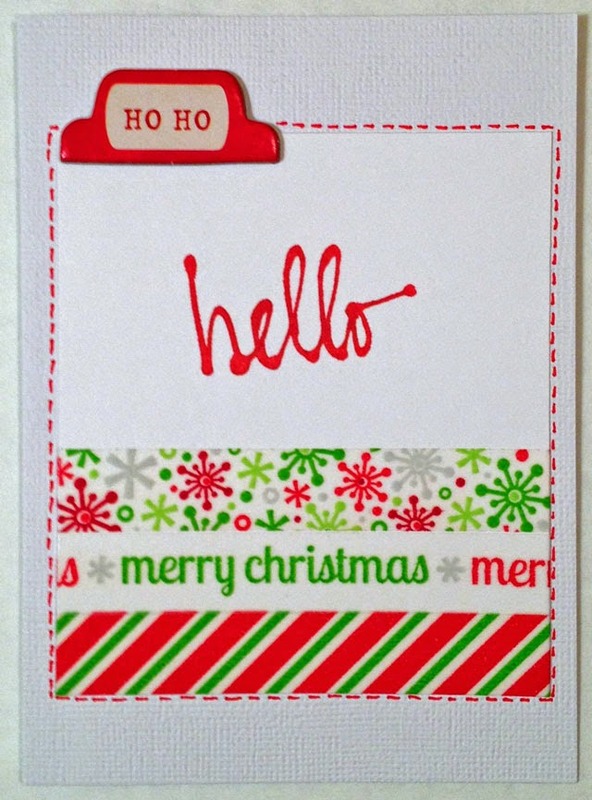 I also tried a simple card with just a few strips of washi tape along the bottom, a chipboard tab & a stamped Hello. After I adhered the card front on, this one didn't look finished to me, so I grabbed my red pen and added some faux stitching. What do you think? Did that finish it off? 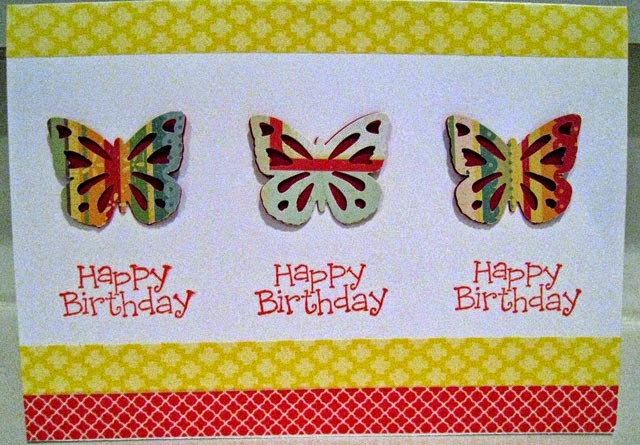 For these last three cards, I used chipboard pieces rather than words. Did you get a chance to join in with Jennifer's event? Which items did you find most inspiring? This year I've been enjoying Cheri's Year of Kindness Challenges - weekly challenges to include kindness in our lives. Last week Cheri encouraged us to Recycle and this week she encourages us to Upcycle as a way to be kind to Mother Earth. I have to admit that no one is going to mistake me for a tree hugger or claim that I live a totally green lifestyle. However I do make an effort to be responsible. Here are a few examples of what I do to help conserve our natural resources (and the things I just haven't given up yet that a more environmentally conscious person might frown upon). *I take reusable canvas shopping bags to the grocery store (& Target because they give a 5 cent discount). *When I do bring home plastic shopping bags, I use those for trash bags rather than throwing them out & purchasing more bags to collect the trash. *I recycle daily - it's very easy here because we have curbside recycling. All we do is throw all our recyclables (papers, plastics, glass, metals) into one large container that's emptied every other week. *I turn the water off while I'm brushing my teeth, yet I still take a bath in my nice big jetted tub most evenings. *I print out things that I want to read, even though I don't plan on keeping them, however I do print on both sides of the paper and then make sure the papers end up in the recycle bin. *I don’t drive a fuel efficient car, but I do consolidate errands. *I rarely buy second-hand clothes, but I do donate my used clothes to a local community outreach along with any other household items that someone else may be able to use. *However, I don’t donate our T-shirts . . . because we typically wear them ‘til they're faded or stained. At that point, we use them for painting and work shirts until they become too worn to wear. Then I cut them up to use as rags. *We have a compost pile, although we haven't used it in a few years. *We use a mulching blade on the lawnmower and purchase special paper bags for any other yard waste (limbs, leaves). The city picks these bags up separately and turns it all into mulch, which is available to residents. 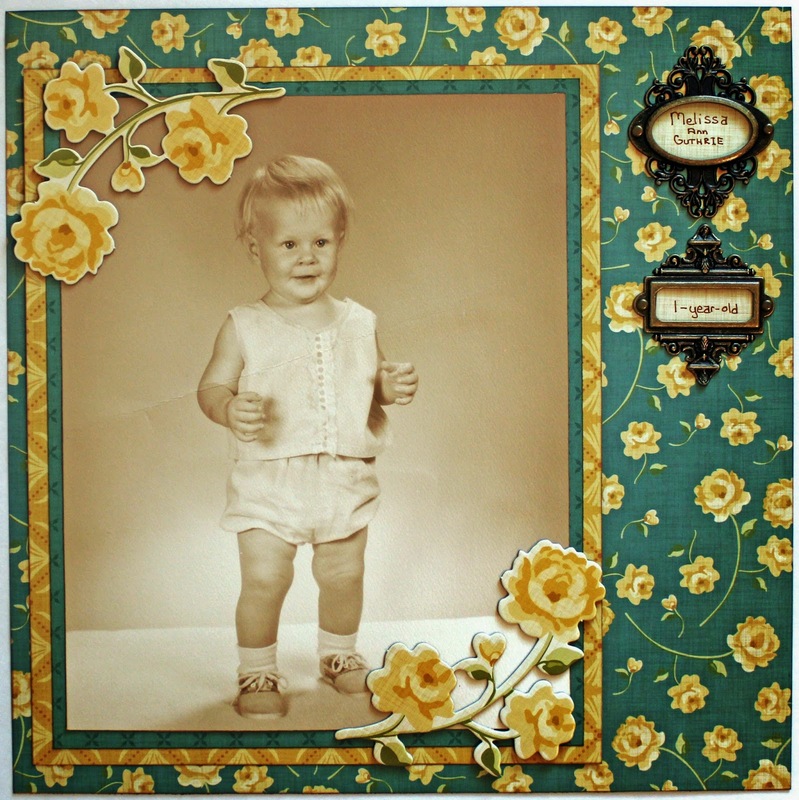 This week Cheri encouraged us to share a favorite upcycled project. A couple of years ago as I was going through some of Robbie's memorabilia boxes, I found his high school senior t-shirt. I still have my senior t-shirt, too, so I pulled them both out knowing that I wanted to find a way to display them together. I finally decided that turning them into pillows would be a good way to make them into something useful and be a FUN way to keep them out on display. Of course, there was a problem . . . I don't really sew and had no idea of exactly what to do. However, I knew someone who could help me! I called on my friend Ellyn who went shopping with me to pick out pillow forms and border material for one pillow . 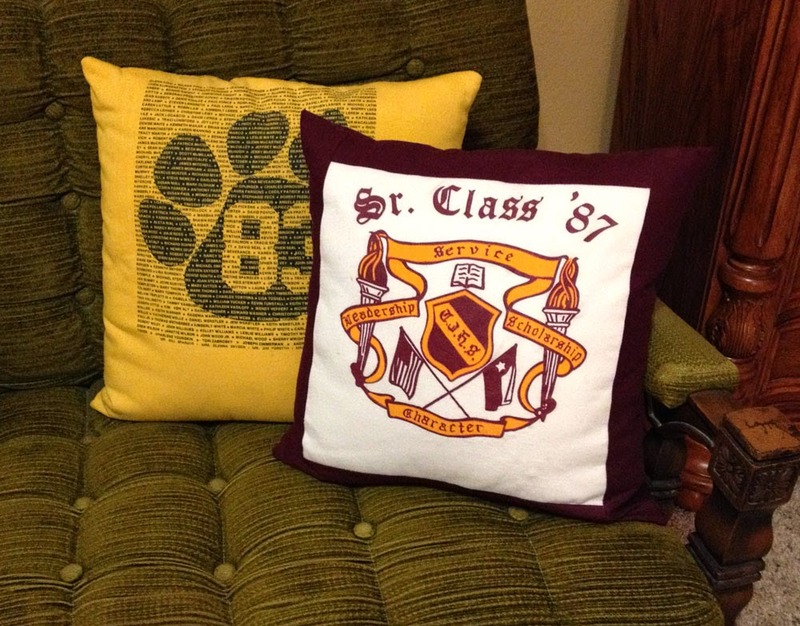 . . and then she took it all home and turned those t-shirts into these pillows! Of course, I also do a good bit of upcycling in my crafting. And this past weekend during Jennifer's Refresh Your Craft & Soul event, I discovered this idea for turning an old book into a pen holder - I really want to try this, but think I'll fill my holder with a collection of bookmarks. Please share in the comments any other ways you recycle or upcycle. I completed a layout using papers and stickers from Reminisce as part of the Design Team for Scrappin' Goodtime. 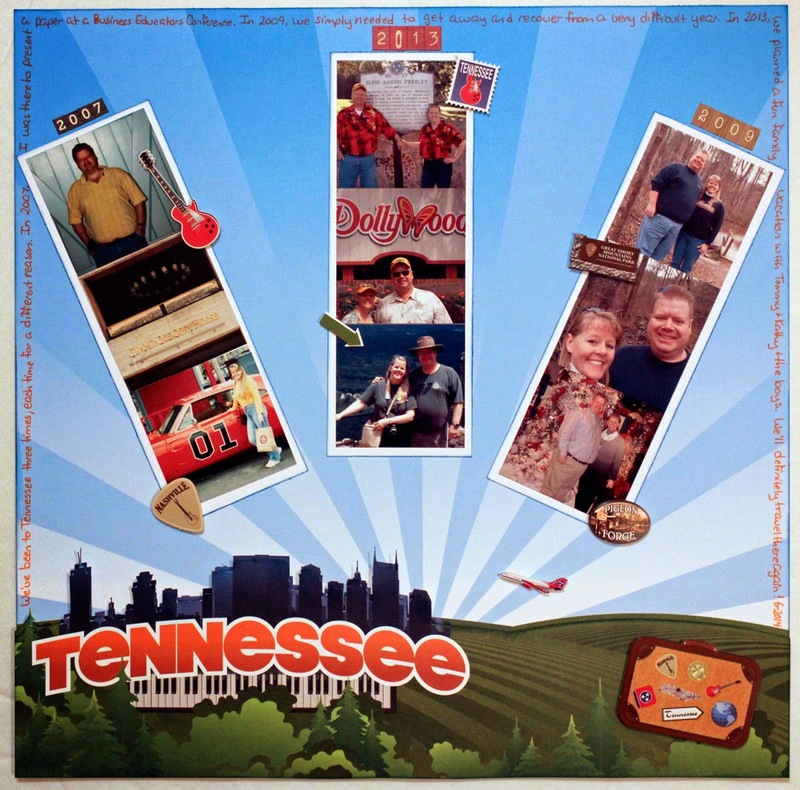 I had so much FUN putting photos from our past three trips to Tennessee together for this layout. It's hard to see in the photo, but there's actually lots of dimension in this layout. 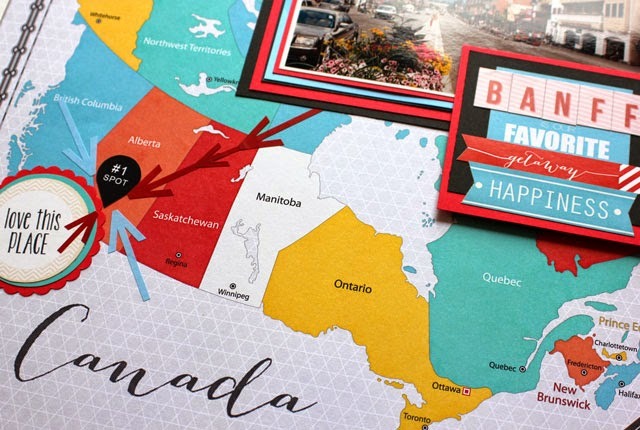 I have a tutorial with step-by-step photos of how I created this layout on the Scrappin' Goodtime blog - I'd love for you to stop by and check it out! Jennifer Grace's Refresh Your Craft & Soul weekend blog event began earlier today, however I just logged on and read the welcome post less than an hour ago. 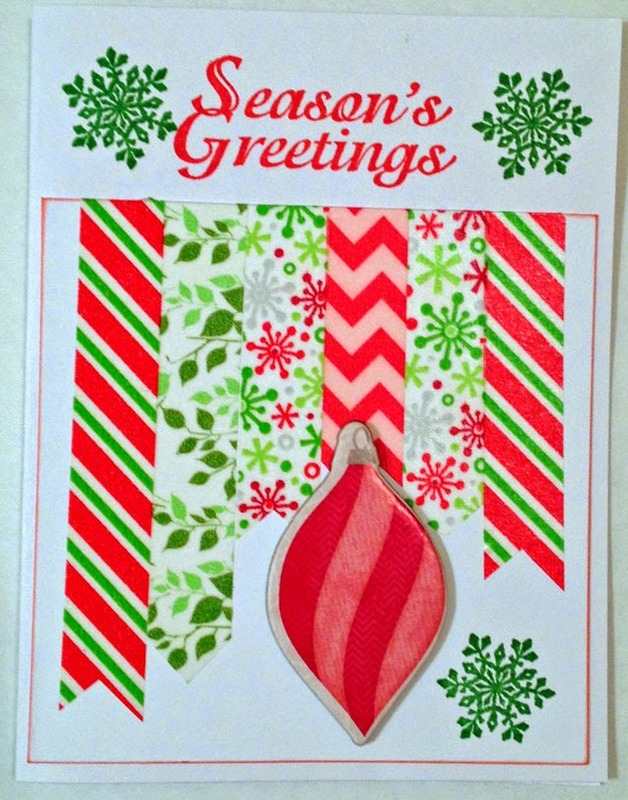 There will be numerous posts throughout the weekend with crafts, tutorials, challenges, tips, a blog hop, and giveaways, but I haven't gotten past that first post because I just had to stop and create a gift tag inspired by her first inspiration piece and tips to use a pocket card as a base, add sentiments, and finish off with a twine bow. Earlier today I had purchased a high school graduation gift for a sweet teenage friend of mine, so I pulled my pink bin (because pink is her second favorite color) and set to work. I actually glued two pocket cards together (the back one has pink hearts) and added two strips of glitter ribbon to start (because glitter is her first favorite color!). Here's what I ended up with. 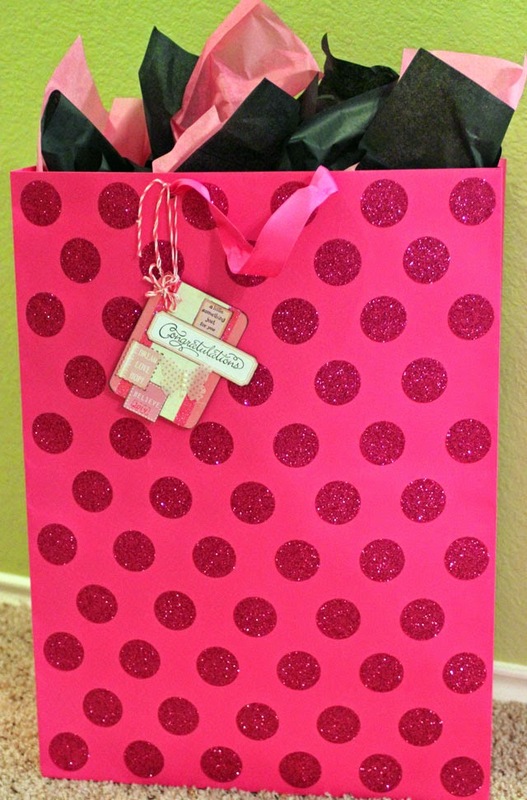 Now that I have the tag completed and the gift wrapped, I'm off to check out more posts over on Jennifer Grace's blog. Will you be joining in this weekend? 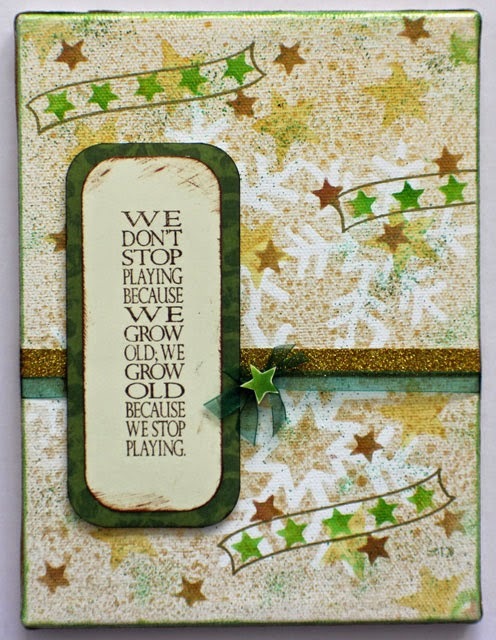 Today I'm sharing more layouts inspired by the BPC Sketch Solutions workshop. These first two layouts were inspired by the lesson four sketch (the digital template of which I used for my layout about Mama & Daddy's first apartment) and the challenge to increase the number of photos in the sketch. 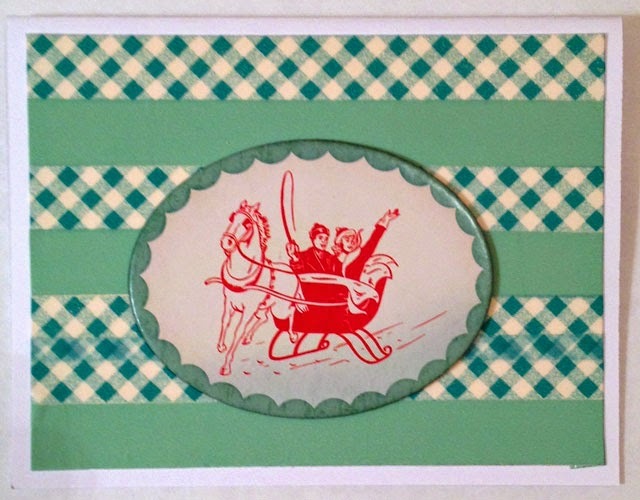 First, I used one 5x7 photo like the original sketch, although I modified the layout of the background papers. Next I used two photos in place of the 5x7 photo in the sketch. Here's a closer look at the journaling & title. The following layouts all used the lesson five sketch, which had space for four 4x3 photos. I followed the sketch fairly closely for this first layout. The lesson encouraged us to utilize a sketch by reducing the number of photos, so I replaced the four photos with one larger photo for my next layout. And finally a digital layout using some papers that Alexa created and shared several years ago and twine embellishments created by Cheryl. Together these layouts showcase photos from 1920-something, 1971, 2012 and 2014 - I do so enjoy scrapping inspirationally and not chronologically! How about you? 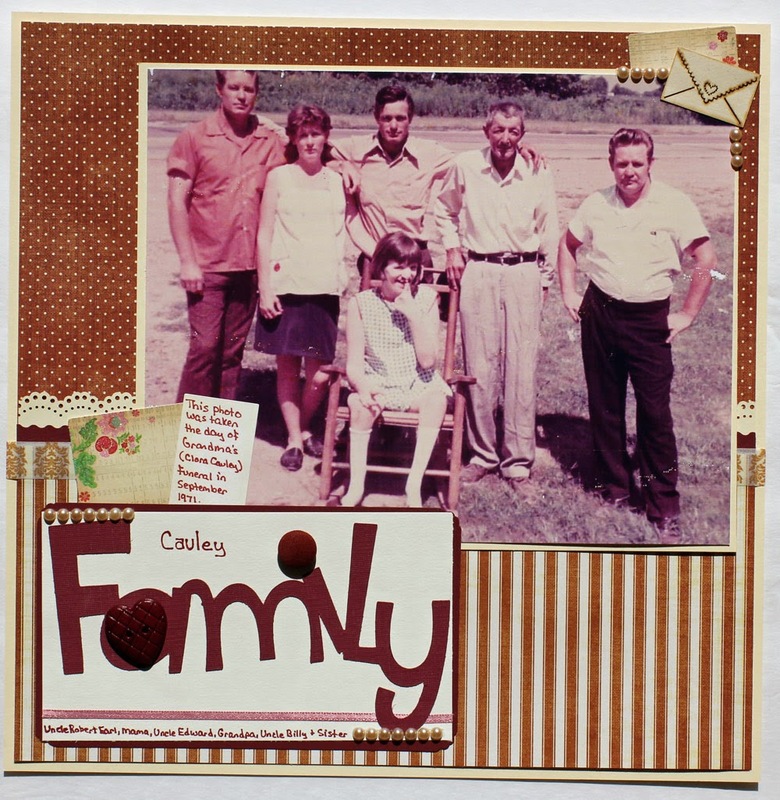 I used the digital template for lesson four in the BPC Sketch Solutions workshop to create a layout showcasing a photo of my parents shortly after they were married. 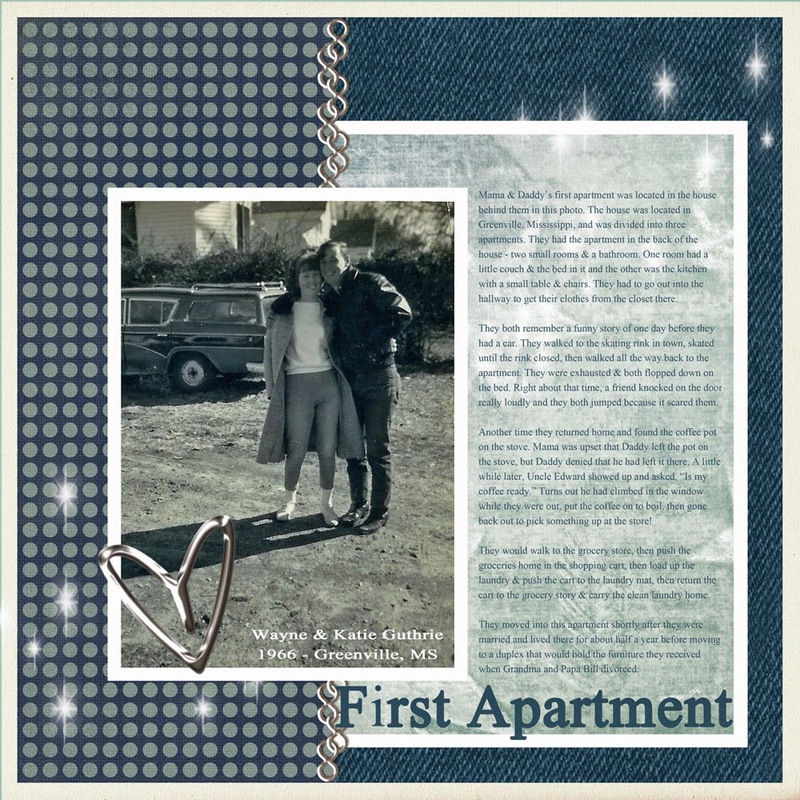 For the journaling on this layout, I called and talked to Mama & Daddy about this photo and their memories of the first apartment they lived in. Journaling reads: Mama & Daddy’s first apartment was located in the house behind them in this photo. The house was located in Greenville, Mississippi, and was divided into three apartments. They had the apartment in the back of the house - two small rooms & a bathroom. One room had a little couch & the bed in it and the other was the kitchen with a small table & chairs. They had to go out into the hallway to get their clothes from the closet there. They both remember a funny story of one day before they had a car. They walked to the skating rink in town, skated until the rink closed, then walked all the way back to the apartment. They were exhausted & both flopped down on the bed. Right about that time, a friend knocked on the door really loudly and they both jumped because it scared them. Another time they returned home and found the coffee pot on the stove. Mama was upset that Daddy left the pot on the stove, but Daddy denied that he had left it there. A little while later, Uncle Edward showed up and asked, “Is my coffee ready.” Turns out he had climbed in the window while they were out, put the coffee on to boil, then gone back out to pick something up at the store! They would walk to the grocery store, then push the groceries home in the shopping cart, then load up the laundry & push the cart to the laundry mat, then return the cart to the grocery story & carry the clean laundry home. They moved into this apartment shortly after they were married and lived there for about half a year before moving to a duplex that would hold the furniture they received when Grandma and Papa Bill divorced. 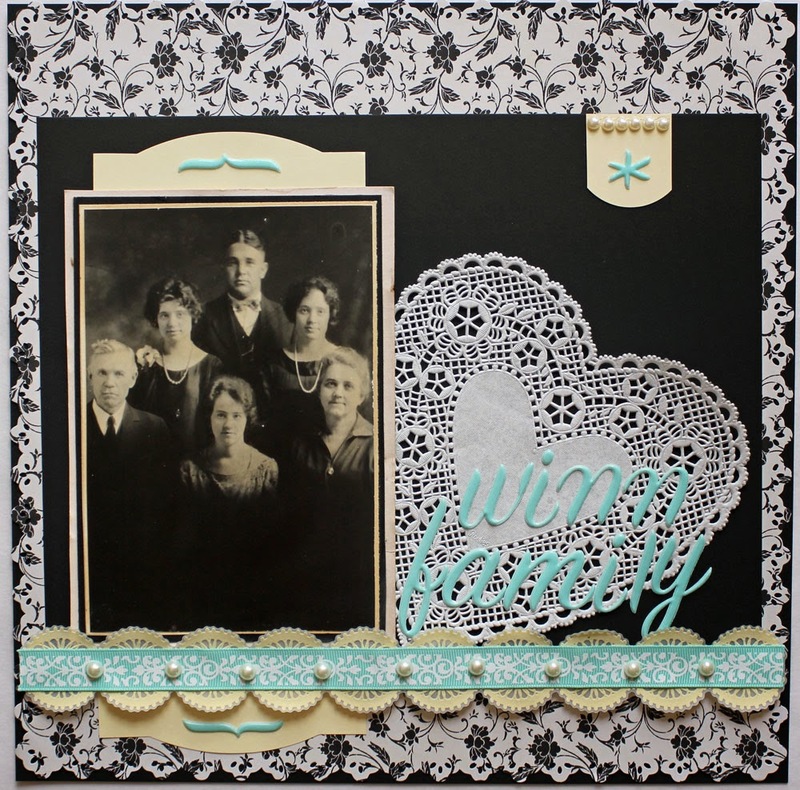 I am so thrilled with this layout and with the stories Mama & Daddy shared about their early married life. Have you scrapped any of your parent's stories lately? May was an extremely FUN month! 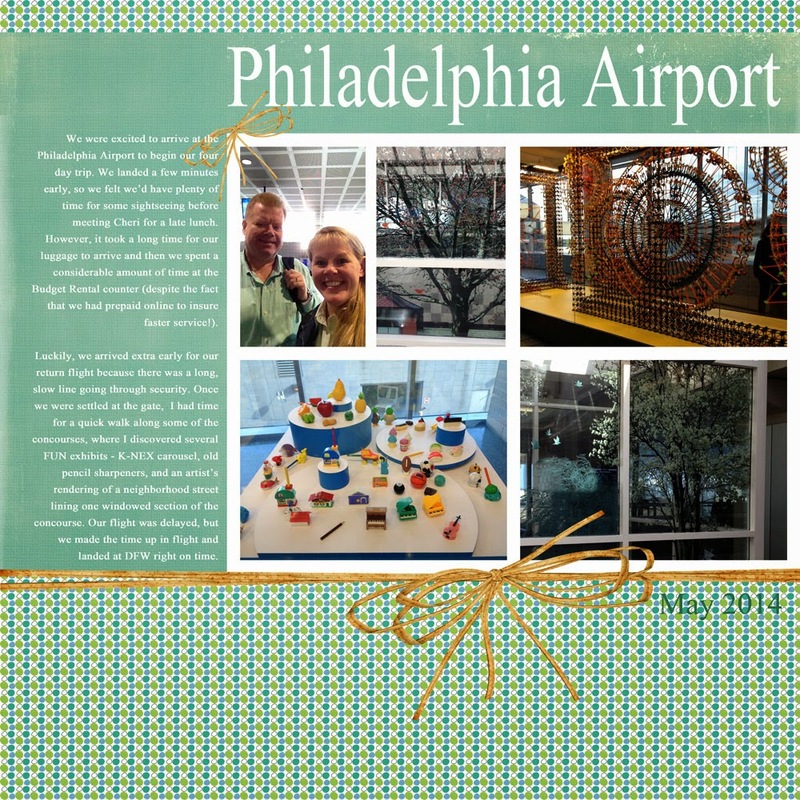 We started the month off with a trip to Pennsylvania where we spent a day with Cheri, then we met up with Robbie's brother, sister-in-law & nephews for three days of FUN including attending the Philly Non-Sport Trading Card show. 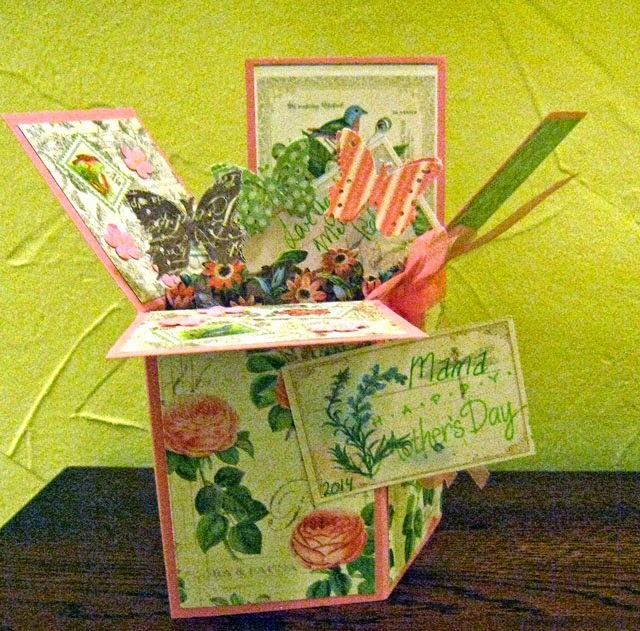 I hosted a Mother's Day Crop here at the house and enjoyed several hours of scrapbooking with Mama & my friend Michelle. 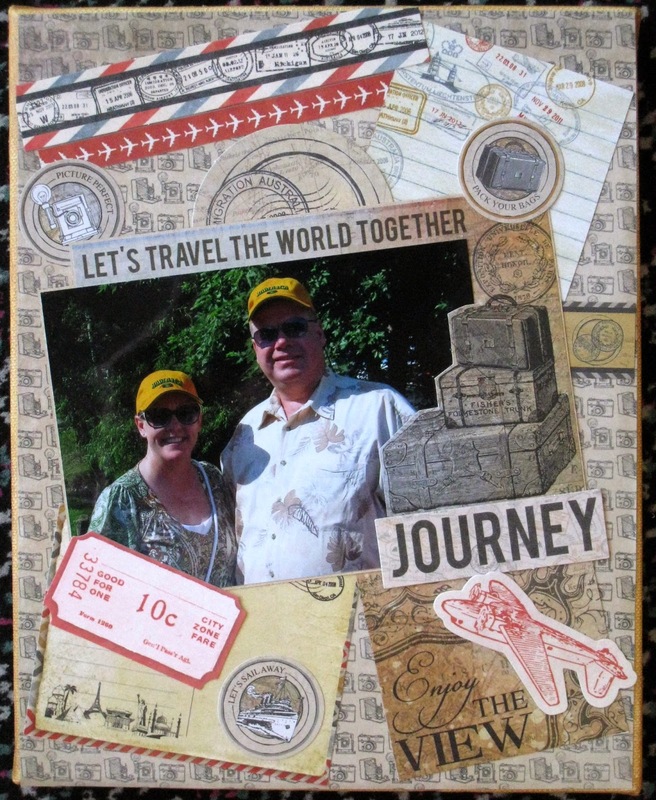 I actually did quite a bit of scrapbooking throughout the month and have been especially inspired by the Sketch Solutions workshop. 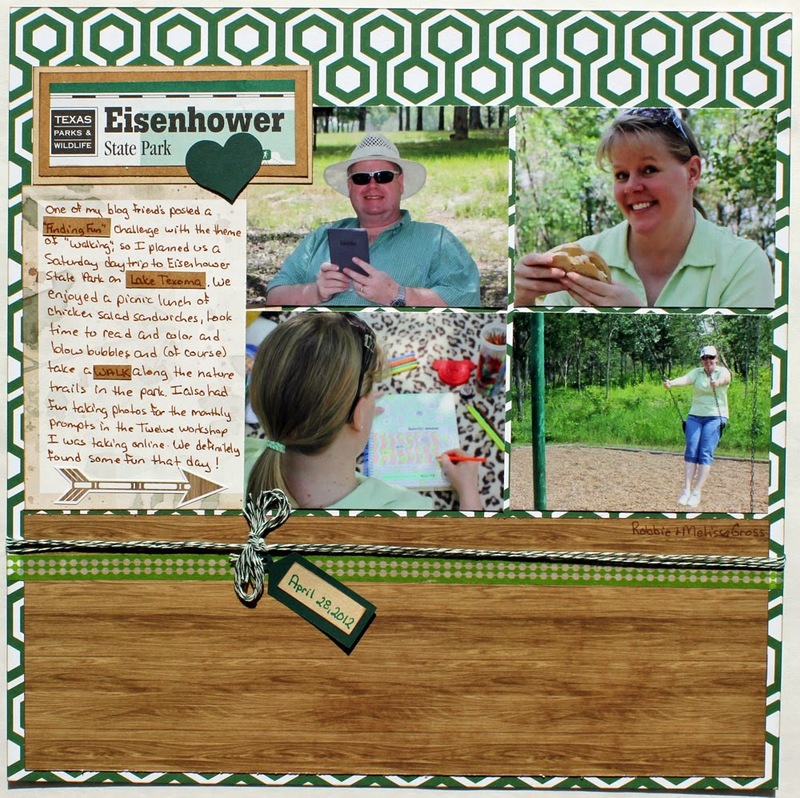 I spent two days watching Lain Ehmann's Scrapbook Your Story on Creative Live. 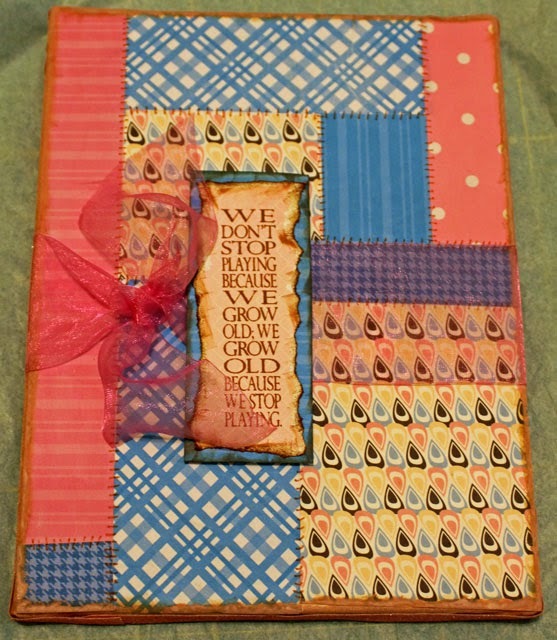 I attended the library book club and enjoyed getting together with friends for Ellyn's Crafty Tuesday. Once again Robbie and I were focused on healthy eating and exercise. We took quite a few walks, and I continued to meet with the personal trainer. We completed another collage puzzle, spent several hours one Saturday strolling through antique shops in a nearby town, played a FUN game of Chicken Foot with Mama & Daddy (which I won!! ), and watched a bunch of episodes of The Six Million Dollar Man. 1. The Amazing Spider-Man 2 - Great movie, although I didn't realize it was going to have a sad ending. We saw this movie in 3-D, in an almost empty theatre, in Pennsylvania, with our nephews (& their parents) - so much FUN! 2. Heaven Is For Real - Great movie, although not as good as the book. 3. Godzilla - Great movie! I wasn't sure what to expect from this one, but it was so well done - we both thoroughly enjoyed it! 4. X-Men: Days of Future Past - Great movie, however when it first started I had no idea what was going on! There's a huge battle raging and I didn't really know who everyone was, but that is all eventually clear and the story is great. There's a wonderfully FUN scene where a very young Quicksilver rearranges everything and causes a tumult that allows Wolverine and Professor Xavier to complete their breakout of Magneto (from deep underneath the Pentagon)! 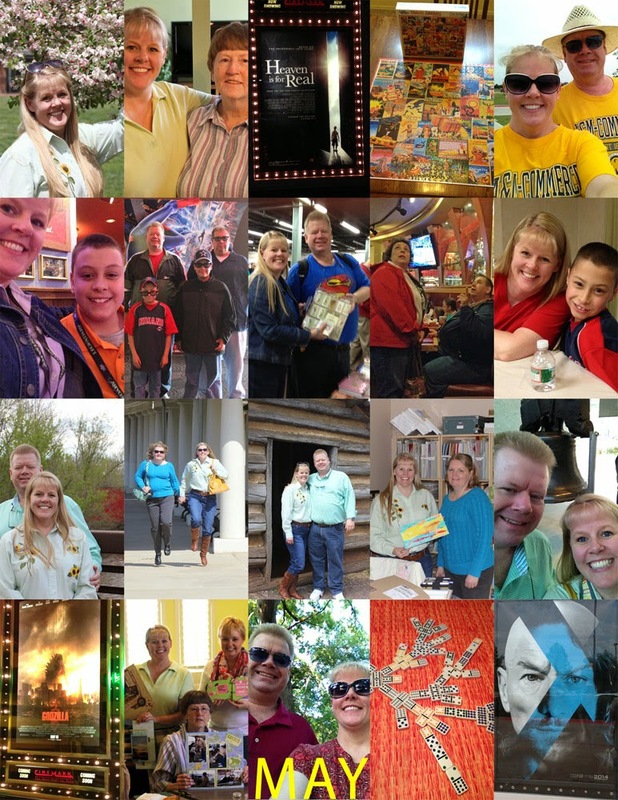 Here's a look at my FUN May photo collage. 1. Participating in Rinda's Summertime Photography Scavenger Hunt for the third year. 2. 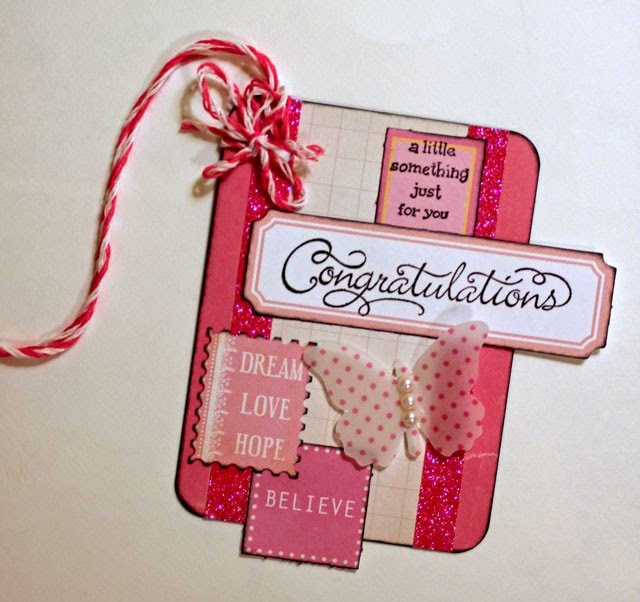 Online classes - One Little Word, Inspired Scrapbooking, Sketch Solutions. 3. Seeing a movie or two, playing games, taking walks & putting together puzzles with Robbie. 5. Watching a Texas Rangers and Cleveland Indians baseball game at Rangers Ballpark. 6. Joining in with The Summer of Color: Smudge, Splash, Plop! Did you have a FUN May? What FUN things are you planning for June?